Thirty years ago, a bath rack was just a bath rack. Thanks to a booming economy, consumers have begun demanding more aesthetically-integrated designs with high-end materials. Inexpensive, “practical” metals are giving way to titanium alloys with brass finishes. Like the kitchen, the bath is evolving into new design opportunities for quality, form, and authenticity. “I want it to look authentic.” It’s the new mantra from today’s design-savvy consumer. Bathrooms are no longer dictated solely by form and function. Simple, inexpensive towel bars formerly outsourced to overseas fabricators are no longer sufficient. But how can OEMs provide nickel-brushed and brass-finished bath racks, when traditional metal die-casting makes these these items cost-prohibitive? Fortunately, innovative hydroforming solutions have opened the manufacturing door to cost-effective, never-before produced shapes, textures, and colors in bathroom design. OEMs can now deliver towel bars, cabinet handles, faucet spouts, and a variety of bath racks that are both elegant and ergonomic. Graceful design concepts, with the authenticity of true metal construction, are now available — at a budget never thought possible. Plus, previous flaws associated with traditional metal forming methods are virtually eliminated, such as burrs, scuffs, and stretch lines. Precision tolerances without springback, less waste, and the ability to cost-effectively work with a wide range of metals are just a few benefits of hydroforming. 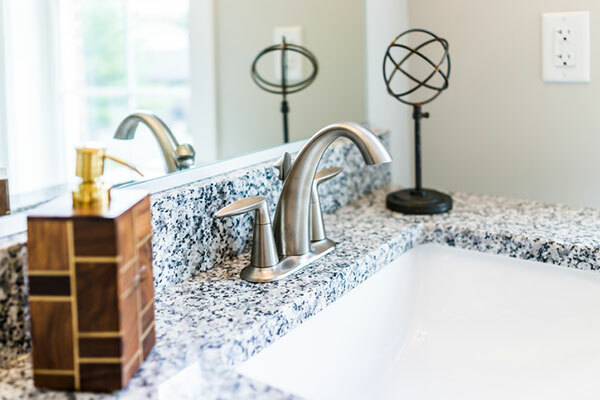 With the technology now available to transform a bathroom metal part into almost any shape, OEMs are tasked with finding the right manufacturing partner to begin integrating design aesthetics into faucets, towel bars, cabinet handles, and other traditional “functional” parts. Versatility, innovation, experience… OEMs now require a metal part and assembly manufacturer who can take bathroom handles from concept to reality without breaking the bank. Your new partner should have the expertise to analyze the engineering requirements for your specifications and match them with applicable parameters. Does the manufacturer have the ability to develop multi-part bath assemblies into lighter, stronger metal hydroformed parts? Can they produce lightweight, complex handles with seamless cross-shapes? Are they asking the right questions to determine the desired shape you’re looking to achieve? Most importantly, are they willing become your partner to take your concept to reality and not just another vendor? Since 1945, Mills Products has earned the reputation for delivering quality and cost effective solutions to these logistical challenges. We pioneered the concept of tubular hydroforming — which can now enable bathroom designs that were previously impossible to reproduce with traditional metal forming methods. We begin by matching each bathroom part with the optimal metal forming process. Multiple engineering and logistical factors are considered, from potential design flaws and inefficiencies to material selection and time to market. These are only the tip of the design-manufacturing-assembly iceberg. Just as kitchens have adapted to match the design theme of other areas of the home, bathroom handles, towel bars, faucets, and other metal creations must aspire to previously unattainable aesthetics. Mills Products can use hydroforming to produce authentic, quality, graceful tubular designs — from prototypes to large production runs. To learn more about how we can help you achieve highly aesthetic, superior metal parts for the bathroom and beyond, please contact us today.